Insurance Gaps & Failures--Bills, Bills, Bills: Can Charity Care Be The Answer? #1 You had health insurance coverage at your old job, which ended September 20th. The coverage at your new job starts October 1, but on September 25th you got appendicitis, and now you have a big bill. #2 You should have signed up on the Marketplace, or taken your employer insurance, but health coverage seemed expensive so you took a chance. When your daughter broke her leg at school, they called an ambulance. Now you've got an ambulance bill, an ER bill, orthopedist bills...the bills are more than three months of your rent! #3 You have employer insurance, but it is a high-deductible plan. After your spouse got pneumonia and was in the hospital, your family ended up with a $5,000 bill. IF ANY OF THAT SOUNDS FAMILIAR, THERE MAY BE SOME SOLUTIONS! First, don't delay. Don't wait until your bills are nine months old and in collections to get help. If you think that the billers made a mistake (for instance, if they have not billed your insurance), call and make sure they have your correct insurance on the record. If you think the bill is correct, start researching your options immediately. Explore whether you and your family might be eligible for Medicaid. In some cases, people are eligible but don't know that they are. Remember that income cutoffs arehigher for children and pregnant women, and that Medicaid can be applied retroactively for the three months prior to the application date, if you were eligible at that time. (So, if you apply in September, you may be eligible for coverage in June, July, and August.) Medicaid can also be used as secondary insurance, which works well with high-deductible employer plans. You can get help in evaluating eligibility for and applying for Medicaid in many locations. Apply for Medicaid. Explore whether you are Marketplace or employer coverage eligible for the future. If you commit to getting health care in the future, you are more likely to be eligible for Charity Care for your current needs. Apply on the Marketplace (Healthcare.gov). ARE YOU CHARITY CARE ELIGIBLE? Explore Charity Care. Charity Care programs are run by many hospitals and medical organizations (including emergency transport organizations and primary/specialty care organizations). Typically the organizations will want to know why you incurred the bills (e.g., why didn't you have health insurance), and what kind of help you need. They will want information about your income, expenses, and insurance (including gaps)--but short-term gaps and high-deductible programs are typical reasons that charity care will be provided. WHO DO YOU CALL ABOUT CHARITY CARE? Many organizations have Charity Care programs, but they are often hidden. If you call the billing number on the bill, you can ask for information about the "charity care" program or see if there is a patient financial counselor with whom you can speak. Sometimes a bit of research on the organization web site will allow you to find the charity care application. Expect to provide information about your income and assets (typically: taxes, pay stubs, recent bank statements) along with the bills. It also helps to include a letter explaining the circumstances. Generally your application will not be considered until you turn in all of the requested documents and information. In some cases, you can appeal your charity care denial. As a last resort, you can ask for a "self-pay discount for the uninsured" to be applied to your bill--this often reduces your bill substantially. You can also negotiate a payment plan--for example, paying $100/month to pay off the bill so it does not go to collections. 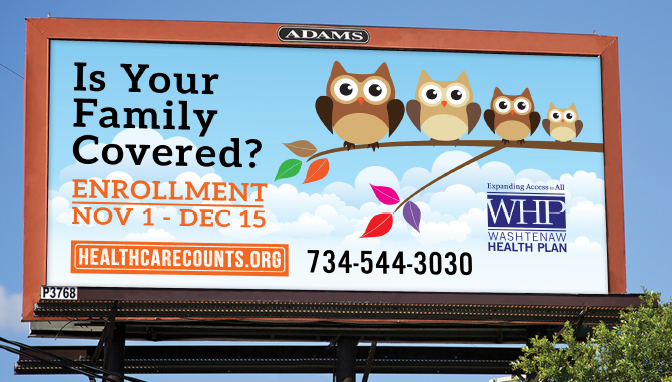 If you need additional assistance, contact the Washtenaw Health Plan. Call (734)544-3030 or walk-in hours are Monday through Friday 9 a.m. to 4 p.m. at 555 Towner, Ypsilanti, MI, 48197.